For the 8th time, Hornfest returns to MRU Conservatory. Nelsen, who’s also hails from Alberta, is the horn player in the Canadian Brass. At the risk of seeming like we’re blowing our own horn, it seems like Alberta’s got talent when it comes to this instrument. Hornfest, which runs the weekend of March 4-5, 2017, is a celebration of horn playing with a particular emphasis on playing together. 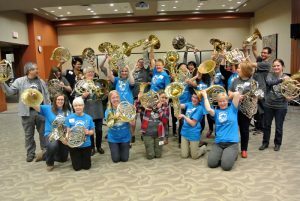 Clinicians and coaches are established horn players like Matiation, Heather Wootton, Douglas Umana and Jennifer Frank-Umana all of whom occupy seats in the Calgary Philharmonic Orchestra. For those contemplating joining, you’re more than welcome. Along with repertoire that includes some movie music, “like some John Williams or (the theme to) Rocky,” Matiation alludes to a special commission that a lucky octet could play, “We have a new piece we might feature this year. It was used at Joan Watson’s memorial service.” Watson was the Principal horn player of the Canadian Opera Company who passed a couple years ago. Matiation is hoping this new work will pay tribute to an inspiring player and teacher who had worked as a clinician at MRU Conservatory. Hornfest continues to enrich the education of local brass players by bringing them together with great instructors and guest artists. Matiation notes the support of the Margaret Stephens Memorial Fund, a fund established after a passionate adult horn player who played in the Westwinds Society Band in Calgary, which allows Hornfest to invite guest artists to come to MRU. It’s this excitement and inspiration that ensures Hornfest will continue to produce and support the upper brass of Canadian horn playing for decades to come. 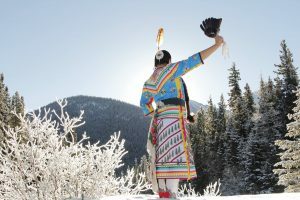 “This course is open to everyone who would like to learn more about Powwow Dance and Hoop Dance,” she says. The course is truly for everyone. McMann started hoop dancing fifteen years ago. She credits her pursuit to great instruction,“I had a really awesome teacher that pushed me to work really hard, and it was an additional creative outlet to music (she also earned a music degree from UCalgary).” Undoubtedly, her instruction mirrors that inspiration in her students. “The course is built around 5 hoops, each week, each participant learns physical skills, different formations, and also learn local indigenous history as well as from my own people.” In addition, for those looking to bolster their physical fitness regime, it’s apparently quite the workout. In offering this course, McMann hopes to build awareness between cultures and bring people of all backgrounds together. This is one initiative that is well-aligned with MRU’s campus-wide Indiginization process. With an expanding list of diverse artistic pursuits, the Conservatory promises to be as invaluable an arts education centre in it’s second century of operation. Carnegie Hall is booking quite a few Calgarians these days. The Music To Your Ears concert season at MRU Conservatory seems to have a few of the same accomplished names listed on the roster. Soundscape Series pianist Jan Lisiecki debuted there in 2016. Now, pianist Colleen Athparia will be playing the famed stage on January 26th, 2017 with her chamber group, Ensemble Resonance. What’s harmonious about this duet is that Colleen was Jan’s very first piano teacher. At 21, Jan is still considered young to have a Juno Award for anything, let alone Classical Album of the Year (2013), which he received in his late teens. He has been a recording artist with Deutsche Grammophon since 2010 with works including Mozart and Chopin. Most recently, he released a compilation of works by Schumann. 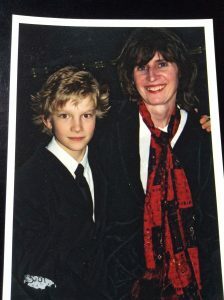 The New York Times described Lisiecki as, “A pianist who makes every note count.” He certainly seems to be doing so with a hometown concert at the Bella Concert Hall on January 20th, 2017. On the challenging side, “When he was very young, he was often distracted by the squirrels running by the studio window than on his lesson,” she laughs. Whatever the compromise was, it seems to have worked, for Jan Lisiecki has left YYC and seldom looks back. As for Athparia, she has teamed up with Stan Climie (Bass Clarinet), Steve Lubiarz (Violin) and Michelle Todd (Soprano) to form Ensemble Resonance who, before taking their program to Carnegie Hall, will play as a part of the Salon Series in the TransAlta Pavilion this Saturday, January 14th, 2017. The program is in celebration of Canada’s 150th birthday and features works from some of Canada’s leading composers including Harry Somers, Robert Rosen and Juno Award-winner Allan Bell. “Even when I was living in London in the back of my mind I knew I wanted to be in Calgary in the long run,” says performing artist Raghav Mathur, known commercially as Raghav, one of the acclaimed international artists playing the Bella Concert Hall this fall. His departure from Canada gave him his global launch pad. With his debut album Storyteller (2004), his UK hits “So Confused” and “Angel Eyes” literally put him on the musical map. While rarely able to move about the UK without a paparazzi trail, back in his home and native land, Canadians didn’t catch the Raghav fever until 2011. Hearing just one chorus of the hooky single “Fire”, which charted on Canadian Billboard Hot 100, it’s clear why it won “Best Song” for the Canadian Radio Music Awards 2012 and became his most successful North American single to date. Collaboration is a big part of his creative process and the growing list of artists and producers he has worked with is a testament to his global vision. Oscar-winning composer A R Rahman, who’s most recognizable for the score to Slumdog Millionaire (which won Best Picture in 2008), produced the song “Ishq Shava” from the 2012 Indian film Jab Tak Hai Jaan. Reggae legends Sly & Robbie produced half his debut album while artists like Redman, Kardinal Offishall and Nelly are just a few of the notable talents you’ll hear on Raghav’s three commercial releases Storyteller (2004), Identity (2009) and The Phoenix (2012). In a live performance, as with a global trip, there’s a phrase musicians use to encapsulate the journey, “Bring it home.” That’s the plan for Raghav. He admits that a homecoming show at the Bella Concert Hall is, indeed, a happy landing. Raghav will be playing the Bella Concert Hall on Wednesday, January 18, 2017 as a part of MRU Conservatory’s Music To Your Ears Concert Season.